In answer to a question about the Dead Sea, via Facebook from my American friend Carol Lynn. Masada, a World Heritage Site, Symbol of Freedom. The so called ‘Dead Sea‘ is actually a very interesting place to discover. I expect you know it is below sea level, the lowest habitable environment on our planet and first invested by mankind a very very long time ago? Measures 45 x 61 cms (18″ x 24″), oils on canvas, £2,000.00, it shows a sunset and symbolically, a crescent moon. Your question Carol Lynn has motivated me to update this web site page, thank you. The Dead Sea valley is part of the Great African Rift Valley thus subject to occasional earth quakes. Even the air has a different feel. In recent years the growing regional population has been causing the Dead Sea to shrink dramatically. The innovative Israelis plan to pipe water from the Med to conserve this unique environment, a world heritage treasure if ever there was one. Israel in general is an amazing country, the Dead Sea being but one of it’s memorable surprises. Land of ‘milk and honey‘ the Bible recounts, for near 1300 years the land lay in ruins. The majority of the Jewish population had been enslaved and or forcibly expelled following a 3 year war trying to free themselves from Roman tyranny (73 A.D). There is an near incredible yet honest account of that war written by a Jewish leader who survived and to the credit of the Romans, his book was approved by the Emperor Augustus who’s son Titus destroyed Jerusalem and very violently suppressed the uprising in A. D. 73. Titus Flavius Josephus, born Joseph ben Matityahu, (יוסף בן מתתיהו, Yosef ben Matityahu), priest, warrior, scholar, wrote “The Jewish War”. There is an inexpensive ‘Penguin‘ copy and much on the internet about the book. I Recommend the book for anyone who wishes to begin to understand the Jewish people, a fair place to start. Israel was part of the Roman and later the Byzantine Empires, a region they called for administrative purposes Greater Palestine. The name Palestine is thought to derive from the Philistines; a warlike sea people of European ancestry, probably Greek related who settled the coast around Gaza and Ashkelon about 1200 B.C.E. They are mentioned in the Bible and in Egyptian records. Arab Islamic invaders turned the entire region into desert and waste land while forbidding ‘non believers’ to live there and making pilgrimage hazardous, expensive and generally very difficult . A few (10% of the population) Jews never left, their descendants still live in the land. A few managed to return among them the renowned doctor and scholar Moses Maimonides (Moïse Maïmonide) who wrote “Guide to the Perplexed”, a book as fresh today as it was in the 13 th century when he wrote it at Safed in Israel. Jewish people still sometimes say, “from Moses to Moses there was no one like Moses“. But Jews were not permitted to own property or land until the Turks began to allow land sales at exorbitant prices for Jews around about 1850. Consequently the Dead Sea region like 90 % of the country slumbered, turned to sand, dust and myth. To return to the Dead Sea and Josephus; most of the stories Josephus related were not believed until lead by Israeli archaeologists, International teams began to verify his accounts during the late 1940’s and 1950’s. The most extraordinary tale Josephus wrote was placed in the Dead Sea valley, the siege and destruction by the Romans of the last free Jewish stronghold of that period. Masada was a mountain top fortress built by king Herod in part as a ‘retreat’ with a palace that included fresh water swimming pools, in part to protect the rich camel train trade that used to transverse the Dead Sea valley and to protect Israel’s South Eastern frontiers. Masada is best seen at dusk or sunrise, also superb is to see the sunrise from Masada over the mountains of Moab on the opposite shore of the Dead Sea. Masada, in the Dead Sea Valley, Israel, has to be one of the most challenging places you will ever visit. The snake path ascent, very steep up near vertical cliffs is challenge enough for some. 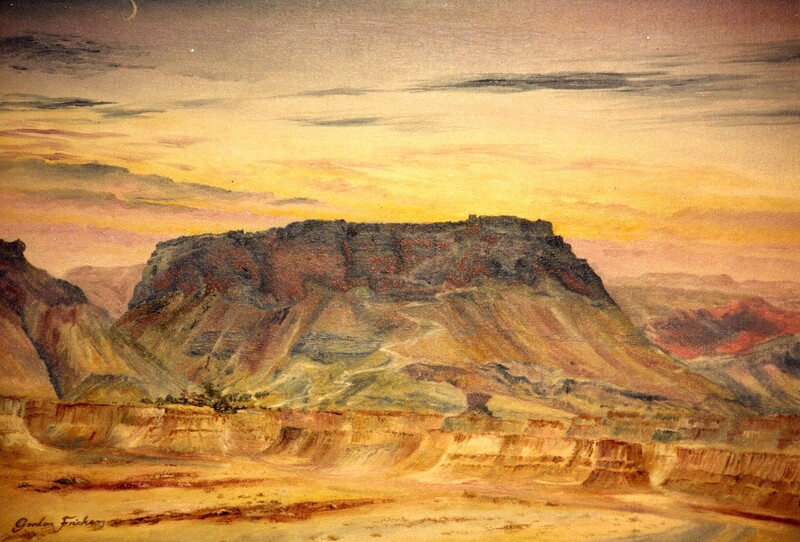 This painting was created from location studies and made soon after visiting Masada. Only two narrow steep paths lead to the summit of Masada. I have sweated up the ‘Snake path’ inspired in part by the lady who is now my former wife. There is a cable car however we wanted to understand how it felt to ascend the mountain. The Masada site is an unforgettable experience for many reasons. Not least you can see for yourself the engineering works and camps the Romans built, a huge effort to take the fortress. On the last night before conquest all the defenders, men women and children (913) bar a very few committed suicide rather than become slaves. Josephus recounts their last hours, how they burnt their military supplies but left the food and water intact to show the Romans they could have stayed on Masada for many more years. One can still see much of the fortress, palace, the Roman camps and a huge ramp the Romans built using Jewish slave labour. Josephus described the siege in great detail; for centuries academics pooh pooed his account. On a lighter note, Masada is a great place to watch the sun rise over the Jordanian mountains and set over the Judean mountains. Today Israeli conscripts (meaning late teen age boys and girls) complete their military training with a visit to Masada and an oath ‘Masada will never fall again‘. There are very fine views of the Dead Sea valley from the summit of Masada, a recommended experience. That aside, there is a beautiful ‘oasis’ at En Gedi, discreet hotels, and of course one can experience the thermal baths and swim in the Dead Sea, both said to be very good for ones’ skin. As if that is not enough, at the northern end of the Dead Sea lies the town of Jericho, some claim the oldest city in the world, certainly worth a visit, also a place were by tradition Jesus spent 40 days and was tempted by Satan, the remains of a Jewish monastic settlement (Qumran) that existed for several hundred years until destroyed by the Romans Qumran and is thought to be where the famous Dead Sea Scrolls were written then hidden in nearby caves to await rediscovery during the 1940’s and 50’s. To the south the land is very salty, an extraordinary sight, desolate even today except for the Dead Sea Salt Works. Three thousand + years back, the land was rich and fertile, the site of numerous towns. Sodom and Gemorrah being the most famous in their time for the production of asphalt. Climate change, poor farming methods, changing trade demands, and earth quakes changed that long ago. This is but a brief introduction through the experiences of an artist, there is of course much more to tell. You can find much more about it on the Internet however there is no substitute for experiencing the Dead Sea valley and Israel in general. 2 visits to the Dead Sea Valley. To my life long friend Justin Phillips who introduced me to many things including the writings of Josephus. Carol Lynn who motivated the above text which I hope you will enjoy and share. By arrangement payments can be in installments. How much in my currency? Try our free XE Currency converter. Enjoying your visit, found something you like? Share with friends, spread the word to all who appreciate the sea, fine art and history. You can help other people discover, enjoy, benefit from this remarkable, unique project widely know. Copyright 2016: Please read carefully. For professional purposes we are happy to issue licences. Always credit his name and where possible this web site. Quoting your source helps your credibility, the artist and others to find and enjoy this art. For educational and private use we allow a free copy. However please note; as with all artist’s work, by International law these pictures and texts belong to the artist and his descendants, so may only be copied after written permission and for commercial use, after a copyright fee has been agreed and paid. Respect the long hours, years, the art and texts, don’t infringe.